Two posts in a day! But first, an apology. As I perused the packaging for tonight's dinner, it occurred to me that I had erroneously missed the possessive apostrophe in the Wattie's brand name in my previous posts. To be honest, I had assumed that this was a company belonging to a family named Wattie, and therefore multiple Watties were involved in the branding. It had not occurred to me at all that the manufacturer of this fine food belonged to a singular member of the Wattie clan. For this, I am truly sorry. But anyway, I had low hopes for this offering, to be honest. The pumpkin content had me expecting another sloppy soup-like offering not dissimilar to the pumpkin and sweetcorn tin we had tasted earlier in the week, and I did not hold much in the way of expectations for the kumara or carrot shining through. This prejudice was further enhanced by the fact that none of the foods I had tried so far had managed to escape the sweet categorisation. As an interesting diversion, I find it noteworthy that my spell checker insists on capatilisimg the 'K' in kumara. Perhaps the West Coast settlement marking the starting point of the Coast to Coast race has achieved more international notoriety than its namesake sweet potato. First impression: the viscosity of this purée was much lower than I had predicted: again, my previous pumpkin memories were playing on my mind. Checking the packet, indeed water (for cooking) was amongst the ingredients listed, and perhaps had not quite dissipated during the heating process as had been intended. A paste was a deeper orange, perhaps more influenced by the kumura and carrot (nothing but traditional orange in Wattie' s, no purple carrots to be seen here). Emily's Reaction: A mixed bag. We had just returned from her grandparents' house prior to the evening meal, and she had fallen asleep in the car prior to being woken for dinner. First attempt at a sitting was a disaster, with a few spoonfuls swallowed heartily, followed by much gnashing of bare gums and howling. An interlude of ten minutes of walking around the house ensued, after which her gusto for eating was restored, and. The majority of the packet consumed in rapid time. Bouquet: Again, unsurprisingly, very pumpkins. However, this time, the pumpkin was balanced finely with hints of kumara, and perhaps a dash of the unlisted apple present. The carrot was, sadly, again absent on the nose, and perhaps was present in the blend only for colour. Taste test: On first presentation, not as watery as anticipated. A pleasant soft, fine, puréed sensation the mouth. 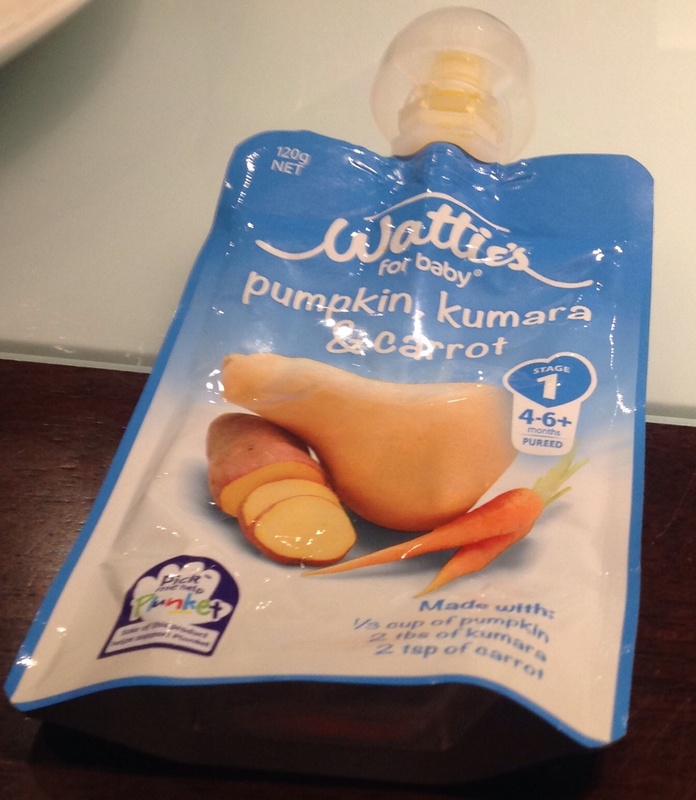 The almost half of the purée made of pumpkin was balanced finely with the slightly sweet tone ps of kumara, giving a delightful savoury experience. If all you have eaten is is a combination of sweet purées in the past, I can imagine this taste being a slghtly acquired one, but to the adult palate, goes down a treat. Overall: 7/10. Finally, a savoury treat, and not as bad as I had feared. Enjoy: Alongside your puréed potatoes and beef, and thickened cask red wine for Sunday lunch during your later years in aged residential care.